It is five years since Hertfordshire Group contributed to a National Society Event. The idea ‘to do something’ had been gelling in the minds of some of the team who had exhibited at Chelsea Flower Show in 2007. Some of us had enjoyed Summer Garden Days hosted by other groups, thought it would be a smaller challenge than hosting a weekend and it would be fun. An inaugural meeting was held in January 2010. Central to the broad discussion was choice of date (it must not conflict with the Olympic Games or The Jubilee Celebration), choice of gardens, the itinerary and transport, catering, nursery plant sales, finance and base hall. The date, Saturday June 30th was clear of the Olympics but only three weeks after the HPS National Weekend in Dunblane. This was an initial worry but Beverley Powlesland (National Events Co-Ordinator) encouraged us to go ahead. That date also suited Tom and Kate Stewart-Smith who agreed to open Serge Hill Gardens especially for us. This was a one off privilege that then determined the choice of the other gardens. From previous experience of Summer Garden Days, HPS members come to see gardens and would resent spending a lot of time sitting in coaches, however pretty the Hertfordshire countryside. Sadly, this ruled out some of our members beautiful gardens in the east of the county. Liz and Jim Machin’s garden in Harpenden and Heather and Peter Osborne’s in St Albans were the final choice. These four gardens were thought to be diverse in size, style and planting, making an interesting contrast. Would they pay extra for a home-made lunch? It is customary to offer additional information for those members who would like to extend their stay. Adrian and Clare de Baat, Margaret and Roger Bardell, Jennifer Parker and Peter and Sue Tomson kindly agreed to open their gardens that weekend. Information on what to see and do around St Albans and further afield was provided. Included were historical buildings, nurseries and gardens open to the public, along with detailed maps and directions. Once approved by the team, all this information had to be photocopied, some to be sent out by post but much was enclosed in a most attractive ‘welcome pack’ for distribution on the day. Did it take just over two years to research all this and put it together? On and off, yes it did! With the attraction of the Serge Hill Gardens our anxiety of a low take-up was allayed; both coaches were full with 75% opting for the home-made quiche, strawberries and cream lunch. The day dawned with a wetting drizzle as we watched David Singleton and team under colourful umbrellas, directing parking. This was very much appreciated by the visitors. In they came in a steady flow, exchanging happy greetings with many familiar friends. Registration was quick and efficient with much admiration of the welcome packs, colour coded either green or yellow to direct them to their coach. A quick coffee, a buzz of plant buying and all the plants were safely stowed on the hall stage, as by now the sun shone and the cars would be too hot. 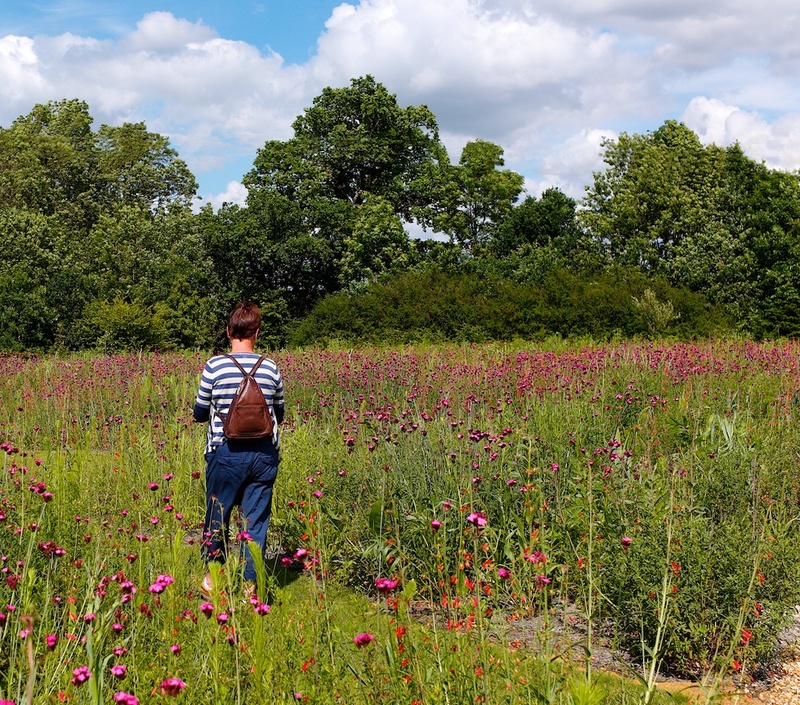 National HPS Chairman Vivienne McGhee wanders through a mass of Dianthus carthusianorum in Tom Stuart-Smith’s prairie planting. The coaches were quickly boarded and then they were off; one to Serge Hill and the other to St Albans. Those at the base then turned their hands to prepare lunch. The twenty eight quiches (half of which were vegetarian), willingly made and given by members, were divided into generous portions. Salads and strawberries were prepared, tables laid and flowers arranged. The return of the two coaches was staggered but overlapped. The delicious lunch was greeted with delight and praise, and then they were off again to the gardens not visited that morning. The base team turned to the task of clearing up. The two members who seemingly spent most of the day washing up were heroes indeed. Our visitors returned in the late afternoon, ecstatic about the gardens and full of congratulations for the diverse choice. The timing had been accurate, the couriers giving just the right amount of information along the way and miraculously the sun had shone all day. 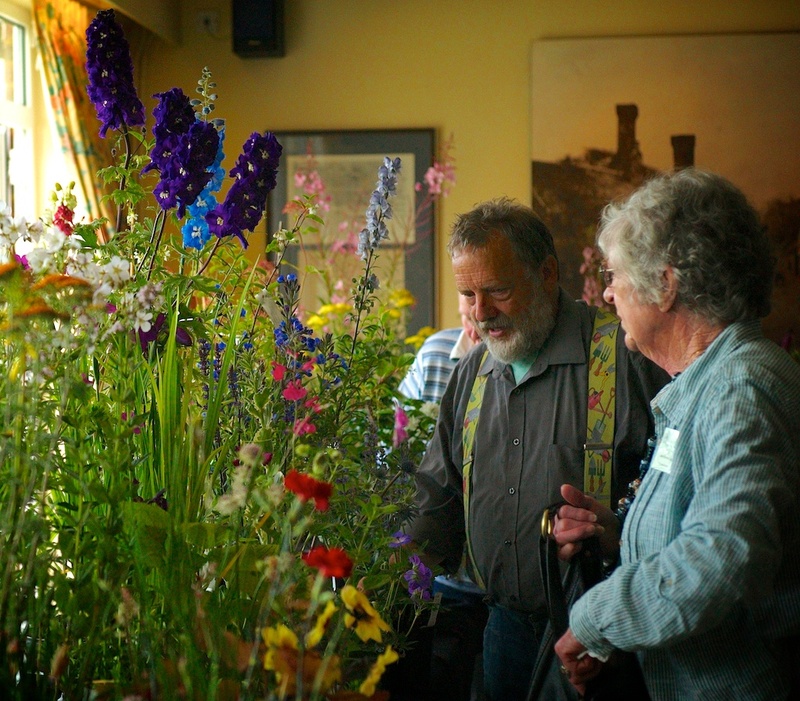 One member who had been on many Summer Garden Days said ‘It was the best I can remember, and I’ve been on a few’. John Spokes from Little Heath Nursery chats to a customer. Apart from thanking all the many Hertfordshire members who helped in so many ways what more could be said? From the HHPS Events Team: Diana Barry, administration; Liz Egre, itinerary and transport; Janet Horton, treasurer and administration; Sue Jaye, nursery organisation and plant crèche; Alison King, catering; Liz Machin, garden owner and plant sale table; Madeleine McCormack, HHPS events co-ordinator; Heather Osborne, garden owner and administration; David Singleton, hall and traffic-control and Roz Willis, catering.